When the leaves start falling, don’t be surprised if you find the truffle lovers among us hunting for truffles—whether it’s in Italy, Croatia or restaurants close to home. Once you’ve been intoxicated by the aroma and taste of these precious tartufi, you’ll crave repeating the experience whenever and wherever you can. Below are some of our favorite blog posts describing our truffle pursuits. We hope the photographs (all taken by the respective writers) and short descriptions will intrigue you to read one or more of the posts in their entirety. While staying in Portico di Romagna, we had the great experience of going along on a truffle hunt with Matteo of Al Vecchio Convento and his dogs, Otto and Rex.The dogs are a special breed of Italian retriever, the Lagotto Romagnolo, that are bred and trained for truffle hunting and are the preferred breed of truffle hunters in this region. The hunt was a success and the following morning we had scrambled eggs on which Matteo grated one of “our” truffles. If you are looking for an authentic taste of Italy on the Upper East Side of Manhattan, Sirio Ristorante at The Pierre (a Taj Hotel) is the perfect spot for dining. The setting is elegant, the style relaxed rather than stuffy, and the textures and tastes delectable. Although the hotel and restaurant share the same fabled Fifth Avenue address across from Central Park, this is no ordinary hotel restaurant. If you arrive during truffle season, you won’t be able to resist some of the dishes on the menu. Just one of many truffle dishes we sampled at Restaurant Zigante, the most famous truffle restaurant in Croatia. This dish is raw minced meat, with shaved truffles, fresh leaves and flower petals. It was incredible! Emilia-Romagana is well known for their abundant funghi, including truffles and porcini mushrooms which we were fortunate to sample in many regional dishes. During our stay at Le Case Antiche in Verucchio, we took a day trip to Sant’Agata Feltria, which is widely known for its white truffle festival in October, for truffle samples at a local specialty shop and a multi-course funghi feast at a family-owned trattoria. When we asked an Italian friend about the best place to experience a truffle dinner, her answer was unequivocal. We soon found ourselves heading to Amerigo 1934, a trattoria in the tiny hill town of Savigno, about 40 minutes southwest of Bologna. Known for its truffle-centric menus, the informal eatery has had a Michelin star since 1998 (one of 27 awarded to restaurants in the region in 2015). At the glitzy Borgata Hotel Casino & Spa in Atlantic City, where spectacular Dale Chihuly blown-glass sculptures greeted me in the lobby, I had the pleasure of a cooking demo with Aram Mardigian–the Executive Chef there at the Wolfgang Puck American Grille. He showed my group how to make garganelli by wrapping the pasta around a Sharpee pen. Of course what made it memorable was the shaving of truffles on top. We were invited to a Black Tie and Truffles lunch at the Ristorante Caterina de’ Medici, one of four restaurants on the campus of the Culinary Institute of America (CIA) that serve as living classrooms for culinary students enrolled at the school. With a three-course menu showcasing dishes prepared with truffles from Asti and Alba, we couldn’t resist. Parchment-thin shavings of prized Alba white truffles transform my breakfast of sizzling fried eggs into fragrant ambrosia, while all around me trifolai in their rustic garb peddle these “white diamonds” to Europe’s top chefs. It’s that time of the year again when the delicious white truffle of Piemonte takes centre stage at Alba’s White Truffle Fair. Every weekend from October 21 until November 15th, thousands of people will visit the market place in Cortile della Maddalena, just off Alba’s main street where truffles of all shapes and sizes are on display and are offered for sale. 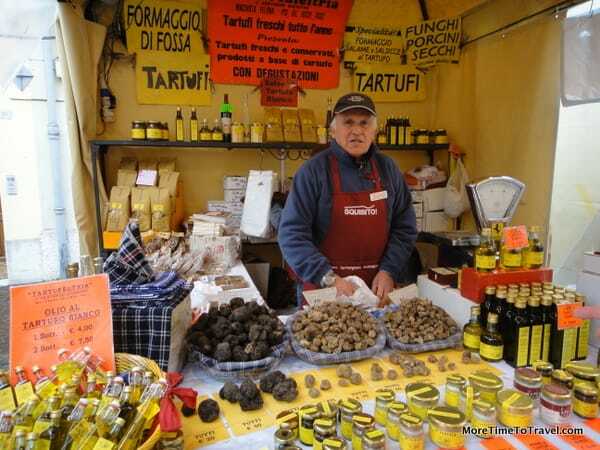 Chat with the truffle sellers and learn all about this wonderful delicacy and then head to the nearest restaurant for a delicious lunch of tajarin (local pasta) and truffles. Local products from this area are also on display. Remember that Piemonte is the home of the slow food movement and the local produce is superb. The clouds and fog are hanging so low and the rain so heavy that we can barely see in front of us. We blindly follow the GPS on our rental car up the single winding mountain road that leads to Sant’Agata Feltria, navigating hairpin turns and precarious drops on both sides. With the same focus and tenacity as foraging pigs, my husband and I are on the hunt for white truffles (tartufi bianchi). This small medieval village is the home of the National White Truffle Fair held every Sunday in October. We keep going back to Alba for the truffle season but we must head further afield and try the truffles from a different region next time! There are so many different options mentioned here. Thanks for the inclusion Irene.